Last weekend BF and I had an impromptu trip to Santa Barbara. 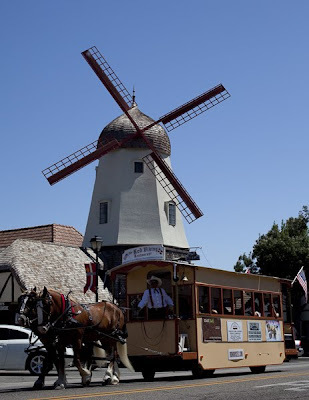 We stayed in Solvang, a little Danish town about 150 miles north of Orange County. It was very relaxing and romantic. We ate like pigs, walked around town and tasted various types of wine. If there was a hiccup in the whole trip it was the drive there (slightly over 3 hours) and back (almost 4 hours) that almost killed us. Bless BF's little heart, he drove both ways, didn't even make a peep and kept me entertained all the while. 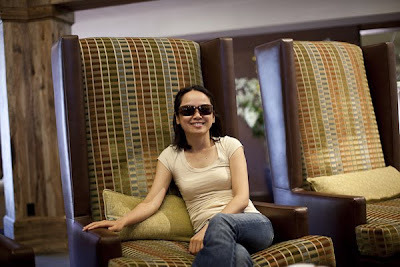 We stayed at Hotel Corque which was newly renovated and I just fell in adoration with these oversize chairs. It's a Danish thing, I think. We discovered Syrah, and Grenache didn't make our favorite varietal list. I don't know if it's the varietal or the winery. We adore Riesling, and Pinot. Although for this trip, we didn't find anything we like very much. We bought a couple bottles of Riesling and something by Ken Brown which we loved after the tasting. I liked Napa wine tasting experience much more! We had diner at Root 246 and it was wonderful. I enjoyed every last bite. The interior of the restaurant was very elegant, all set in beige tone. I ordered Caesar salad topped with a Quail egg and halibut and lobster with sweet corn chowder. The foamy looking thing is actually paprika flavor foam. BF ordered seafood frites and a super yummy steak with onion rings. Did I ever mention I adore onion rings? Of course we can't leave the place without sharing a dessert. This is a version of banana split. For lunch, we decided to try something Danish. We ordered Danish meatball and sausage. I don't know if this is what they really eat in Denmark. I think it is a tourist thing. Of course, I hear about this Aebleskiver thing which is a must try in Solvang. It is pancake balls with raspberry jam and powder sugar. Surprisingly the texture is very light, despite the size (a little over 2 inches in diameter). Overall, the weekend was a success and BF got several brownie points from this unexpected trip. What is your favorite or recent little weekend getaway? ***All the unclear food pictures are taken by me while the clear ones are by BF. My excuse is he has a kickass camera while I don't and I am sticking to the story. Oh you look so nice, dear. Love your pictures. I want the pancake balls with powdered sugar!! what a lovely trip! 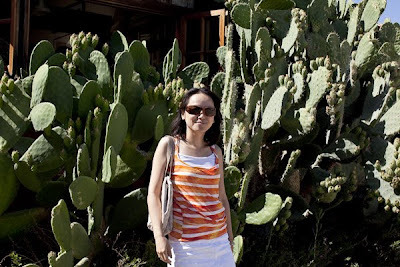 the photo with the huge cacti is awesome! You look lovely dear! It's your smile, you are just glowing! Hi darling- you look so sweet among the cacti :) The boyfriend did a VERY good job! That food looks delish! I am glad you had a nice trip. 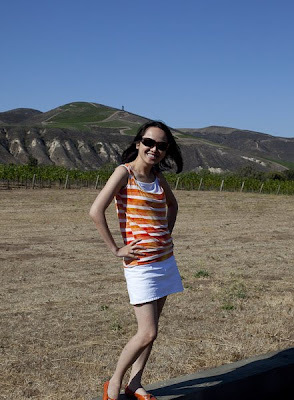 I would love to do a wine tasting trip in CA someday. You look so happy SG, must be the combination of BF & great food, YUM* Well, it's another weekend coming, I know you'd have another fabulous one! bahhhh stop it with all those food pictures. i havn't even had breakfast yet, my tummys grumbling. ahha! ;P and wow, they have a danish town in california? thats pretty cool! i actually have a little weekend getaway coming soon with my family.. we're going up to Whistler which is about 1.5 hours away from where we live, its where the 2010 Olympics will be held! :) have a great weekend you savvvvy girl! Sounds like you had a great time! I am jealous of the wineries, I would love to visit one. I too am I sucker for Riesling! All the food looks delicious! Hi there-sounds like your trip was awesome!! The food looks absolutely delicious, so pleased you both had a great time!! mmm gotta love all the food pics, it makes me so hungry hehe. Sounds like you both had a great time! What a fun surprise! All your food looks so yummy!! yummy trip, darling! you look fabulous! have a wonderful weekend! I love solvang...it is so cute there! what a fabulous treat!!! it looks so fun and so delicious! and that return home drive on sunday from sb is B-R-U-T-A-L. shudder. i used to have a bf in santa barbara, and coming back to la on a sunday afternoon was HORRID. anywhoo, hope you have a good weekend! The place is beautiful and wow Im hungry now coz of those yummy food pics that U posted. how funny we were in the same area last wknd. but looks like u and bf def. had a better time than we did. and seriously, what's up w/the 101 being so jammed on the wknds, too? sux! you looks so cute savvy, why you dont put your BF photo ??? It looks like you had a great trip and all of the food looks so good, especially the pancake balls!